There's no question about it: Princess Charlotte is the official royal scene-stealer. 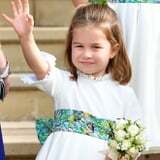 Whether waving to her adoring fans or pulling the best faces, we're positive that the princess is going to be grabbing the spotlight for many years to come. For now, her only concerns are spending time with family and going to nursery school, but it won't be long before she starts having royal duties of her own, like her parents and other senior royals. What duties can we expect from everyone's favorite princess? A lot of it depends not just on her age, but on her proximity to the throne. Charlotte will always be one of the front-line royals, as the daughter of a future king. So far, the only duty Charlotte has been asked to do has been to be a bridesmaid twice: once for her now-aunt Meghan, the Duchess of Sussex, and most recently for her father's cousin Princess Eugenie. In the future, however, her duties will likely increase, especially as her aging into them is likely to coincide with her grandfather Prince Charles's accession to the throne and the subsequent "bumping up" of the whole royal line, eventually making her the daughter of a king when Prince William succeeds (and the sister to one when Prince George does). While the Palace hasn't confirmed anything about Charlotte's future duties, we can get a pretty good guess by looking at some of her predecessors. The royal ladies who would have had the most similar lives would have been Princess Margaret (younger daughter of George VI and sister to the Queen) and Princess Anne, the Queen's only daughter. Both of these women undertook a huge number of public engagements: Princess Anne has been one of the most active royals for most of her life. For the most part, Charlotte's duties will probably include a lot of official engagements such as visits at home and abroad, public appearances, and Palace events. Like most royal women, it's likely that she will become the patron of some charities once she's an adult, depending on what her particular interests are. Because she's in the direct line rather than descended from a younger son, Charlotte probably won't be able to follow in the footsteps of Princesses Beatrice and Eugenie, or of Zara Tindall, who forged non-royal full-time careers; she will be a full-time royal all her life. One more fun fact about Princess Charlotte's future: she is the next person eligible to be given the title "Princess Royal." Currently held by Princess Anne, the title is traditionally given to the eldest daughter of a monarch, but can only be held by one living person at a time (so, for instance, if Charles had had a daughter, she probably wouldn't have been given the title even once Charles was king because Anne would still be alive, too). Only seven women in the history of England have held the title - it seems fitting that the special title could go to a princess who's already proving herself to be pretty special!